It is a unique experience to visit the attic of the cathedral church. However, we would like to point out that you will have to climb 120 steps up a spiral staircase. You will be rewarded with a unique walk along the rain gutter, from where you can see the steep roof and the city. You will enjoy unforgettable views that you will remember forever. This tour only takes place in the summer months from July to September and only in good weather. Tickets can be purchased from the cathedral guide at the South Tower entrance at the indicated tour times. The tour is offered all year round. The tickets are not bound to the date of purchase, but can only be redeemed once. There is no discount for pupils or students. Tour participants are kindly asked to wear appropriate clothing and to behave appropriately. 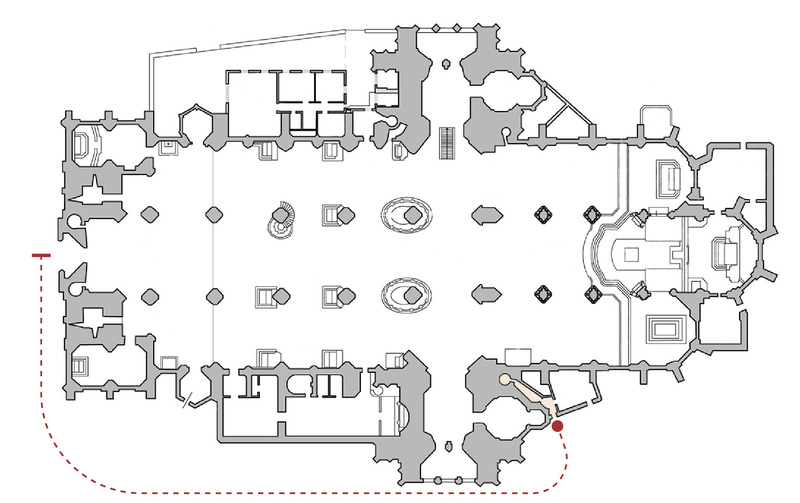 The red dot indicates the meeting place for the tour of the attic. It is located outside the entrance to the South Tower.